After many years with no Cinerama features being shown in any theatre in the world, we are gradually beginning to see some of them return. We must thank a few people for making this happen. Willem Boumeester managed to get Cinerama installed in the The National Museum of Photography, Film & Television in Bradford, England with the able assistance of American John Harvey, and surviving European Cinerama prints were a big draw to a small English university town. 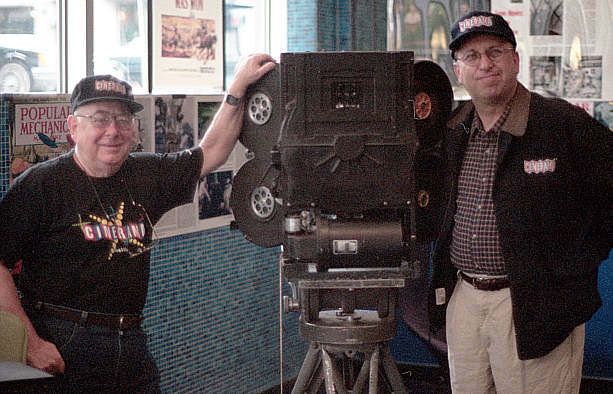 Harvey and Larry Smith moved John's projectors and prints to a small theatre in Dayton, Ohio and Cinerama ran at the New Neon Cinema for three and a half years, slightly longer than the one month initial schedule, and people literally traveled from all over the world to see these screenings. Harvey and Smith brought the prints to Seattle for the grand opening of the refurbished Martin Cinerama theatre, funded by Microsoft guzillionaire Paul Allen and the theatre filled up. Our Australian mate, John Mitchell, who'd been running his old Cinerama prints in his back yard theatre for years, recorded duplicate copies of some of the seven channel magnetic soundtracks as the originals were sometimes no longer useable or were completely lost, and those duplicates made on his garage setup are of astonishing quality. We, the audience for these remarkable pieces of film history, owe these men a debt of gratitude. Sadly, John Harvey has suffered a series of strokes that have disabled him. We all hope that John's tenacity will enable him to overcome the infirmity created by his health problems. He's a good guy. And the man that has done the most to keep the Cinerama torch lit is producer, director, writer, editor David Strohmaier, who has spent almost ten years researching the history of Cinerama after seeing one of Harvey's screenings, and has unearthed lost negatives and coordinated the refurbishment of This Is Cinerama as well as making Hollywood aware of the Cinerama legacy. Few people could have assembled a documentary as insightful as Cinerama Adventure, and no one has the tenacity to bring new life into these remarkable films as has our good friend, David Strohmaier. I maintain a separate website relating to Cinerama Adventure where additional in-depth information on the history of the technique that revolutionized film making can be read. I encourage you to further your studies of Cinerama by visiting www.cineramaadventure.com. Following completion of Cinerama Adventure, and its showing in many assorted film festivals and other venues, including its inclusion in the DVD release of How The West Was Won, Dave continues to play archeologist for further treasures relating to Cinerama and other systems from the great widescreen revolution of the 1950s. Lastly, we must express our gratitude to John Sittig of Cinerama, Inc. for opening the doors to Dave and providing able assistance and support for what has become a modern archeological quest. Without John's support little progress would have been possible. And it must be said that besides John's duties as a company executive, he is probably the most proficient theatre projectionist that we've ever encountered. Three panel Cinerama projection has never looked better than when John is overseeing a show. Friends of Cinerama, and we're fortunate that they also happen to be employed by Cinerama, Inc. At left is Gunther Jung, Cinerama archivist, and at right is John Sittig, director of Cinerama, Inc., a subsidiary of Pacific Theatres, Inc. Between the two is one of the Cinerama cameras. Gunther and John lugged the heavy beast from Los Angeles to Seattle for the opening of the Seattle Cinerama Theatre following its refurbishment. and interview with camera designer. Cinerama was the brain child of motion picture engineer Fred Waller. His work at the Paramount studios in the 1930s led him to the understanding that a sense of depth and realism could be achieved by a wide curved screen that included the viewer's peripheral vision. His first experiments were with a battery of eleven 16mm cameras and projectors that photographed a hemispherical image. 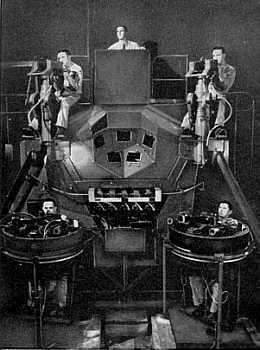 The system was refined to five cameras and projectors and was credited with saving thousands of flyers' lives in World War II as the "Waller Gunnery Trainer", seen below right. 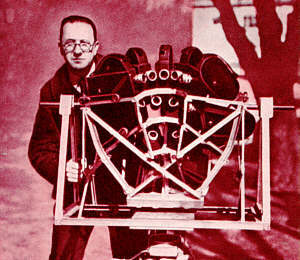 Waller ultimately further refined his Vitarama to use three 35mm cameras and projectors and the screen was modified from a spherical section to an arc. 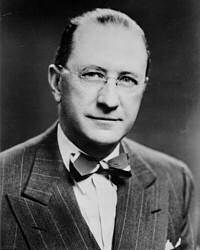 For his sound system, Waller approached recording specialist Hazard Reeves. Reeves was a pioneer in magnetic recording and his concept for the sound for Cinerama was to create a multi channel system to match the dimensions of the screen. Initially the stereophonic sound system consisted of five channels located behind the screen. Reeves added a sixth and seventh channel to feed auditorium speakers under the control of the theatre engineer. Stories stating that the original showings of This Is Cinerama were run with six channel sound, are in error. Cinerama used all seven channels of sound from the very beginning. The sixth and seventh channels fed speakers on the left and right walls of the theatre. Sound was controlled by the "Cinerama Engineer", who, based on cue sheets for the show, could throw a switch that put channel six on both walls and shifted channel seven to speakers in the rear of the theatre. Over the years it became common practice in many theatres to do away with the theatre engineer and leave the controls for channels six and seven set in one of the two positions. One can only wonder why an automatic switching system was never adopted. Such systems were used in a variety of other cinema sound schemes. 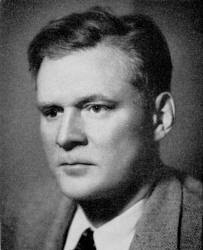 Reeves bought an interest in Cinerama, Inc., and became the president of the company. "Ladies and gentlemen, this is Cinerama" was the tip of the iceberg that Lowell Thomas represented with the success of Cinerama. Thomas was thoroughly convinced that Cinerama represented the beginning of a whole new world in motion picture presentation. His involvement, more than anyone else's, helped get that first film off the ground, and accounted for most of the later product. Additionally, Cinerama was boosted by the typical fervor of Michael Todd, but Todd's fervor was subject to an apparent attention deficit problem and he moved on from project to project. 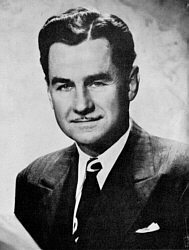 Thomas also enlisted veteran film producer Merian C. Cooper, father of King Kong, and one of the powerful forces that helped get three strip Technicolor off the ground, which helped insure that this first demonstration would be successful. Thomas was president of Cinerama Productions, Inc., as opposed to Cinerama, Inc., the company founded by Waller and initially headed by Reeves. In America, a book issued by Hazard Reeves to interest the U.S. Government in the uses of Cinerama as a virtual reality trainer. Few developments in the motion picture industry delivered what they promised the way the Waller - Reeves system did. Above left, the cover of the World Premiere souvenir book from This Is Cinerama, and above right, ticket stubs from the matinee presentation of the film on New Year's Eve, 1952, found tucked inside the program. Don't let inflation over the past half century fool you, those tickets were expensive for a matinee. And those were very good seats. Drawing of the Broadway Theatre installation that appeared in the Encyclopaedia Brittanica. The screen was built according to the original specifications, with the center 120 degrees curved and the 13 degrees on each side flat. Larger screens didn't usually need to have the sides flattened. Over the years, until the advent of the Super Cinerama theatre design, a great many variations in screen installation were used in order to accommodate architectural features in each theatre conversion. The image is formed from three separate 35mm films and sound is carried on a fourth 35mm magnetic film with 7 soundtracks. The individual frames were six perforations high instead of the usual four and the frame rate was increased from 24 to 26 frames per second to reduce the apparent flicker on the giant 146 degree screen. Cinerama's three frames formed an image of approximately six times the definition of the conventional 35mm film. That resolution, combined with the sharp wide angle lenses with their extended depth of field made for an unparalleled viewing experience. How The West Was Won opening sequence as composed from the individual frames shown above. While this footage was used as the opening shot in the last of the three-strip Cinerama films, it was actually an out-take from the first. Visible in the picture are a number of "bug splats", which are much more evident in the moving picture. Bugs were a problem for pilot Paul Mantz, until he determined that bugs only fly to a maximum altitude of a few hundred feet. To prevent spoiling of any further footage by those pesky bugs he devised a typical Paul Mantz fix. A large sheet of butcher paper was taped over the nose of The Smasher, his converted B-25. After he had achieved an altitude that was bug free he would signal an assistant to lean out a front window and tear the paper loose. No more bug splats. Mantz's flying sequences in This Is Cinerama are bug free, but apparently the producers of How The West Was Won were unconcerned that their film began with the nasty things smeared all over the screen. Despite the bugs, it is a beautiful, awe inspiring scene. In addition to inventing Cinerama, Fred Waller also invented water skiing, which just happened to be featured in the first production.